The continue statement allows jumping to end of the body of a loop, skipping the rest of the code within the loop. Either the next iteration of the loop executes, or the code following the loop statement executes. In most cases, you can rewrite the body of a loop and avoid using a continue statement by using an if statement. The end result is generally more readable. Within the body of an #if/#endif pair, you can include #define or #undef directives. If the body of the #if does contain #define or #undef directives, it must appear before the first token of the containing source file. You can use more complex expressions in #if and #elif directives, instead of just checking to see whether a single conditional compilation symbol is defined. In the example below, the #elif directive triggers if the DOGSBARK symbol is defined and then DOGSGROWL symbol is not defined. You can build more complex expressions using parentheses and the && (logical AND) and || (logical OR) operators. You can conditionally compile code using the #if and #endif preprocessor directive. You can also use an #else clause between the #if and the #endif. 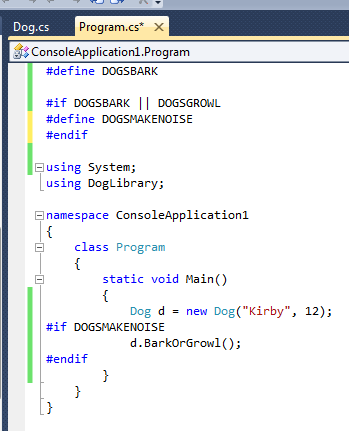 In the code below, we’ve commented out the definition of DOGSBARK, so the code between the #else and #endif will be compiled. Note that the code after the #if directive is greyed out, while the code after the #else is formatted normally. Once you define a conditional compilation symbol using the #define directive, you can use the #if directive to conditionally compile code when the corresponding conditional compilation symbol is defined. 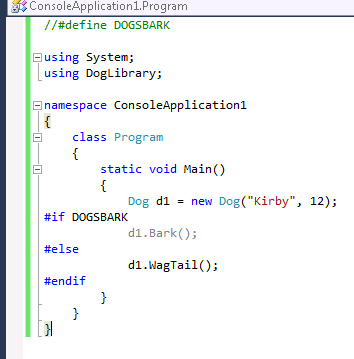 In the code sample below, the Dog.Bark method is called, because the DOGSBARK symbol is defined and so the line containing the call to Bark is compiled. 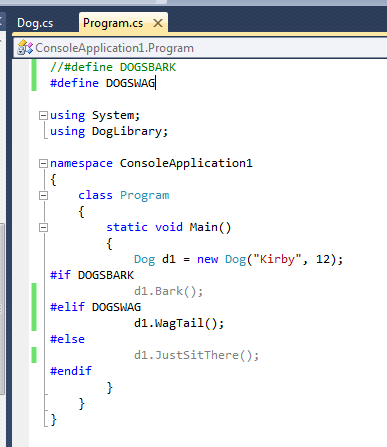 If we don’t define the DOGSBARK symbol, then the compiler doesn’t compile the line between the #if and #endif directives. In fact, since the compiler doesn’t even look at these lines in this case, they don’t even have to contain valid C# syntax. At any given point in your source code, while the compiler is compiling that section of code, a particular conditional compilation symbol is either defined or undefined. A conditional compilation symbol is either defined or undefined–it has no value. You check whether a conditional compilation symbol is defined by using the #if or #elif preprocessor directives. A conditional compilation symbol remains defined in a source file until the end of the containing source file or until encountering an #undef directive (whichever comes first).